Since October 2008 United Nations University has worked with 8 leading African universities to establish a Master’s level education program for sustainable development in Africa. I have been serving as a coordinator of this project. In this talk, I would like to raise some questions on the basis of this experience, especially concerning the role higher education institutions can, and perhaps should, play in promoting sustainable development. 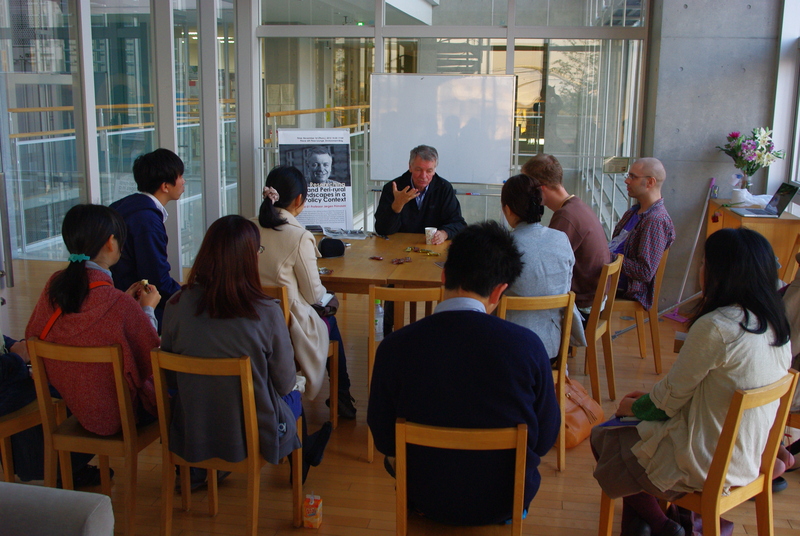 The second special SUSTAIN.CAFE was held on November 16th, 2012. The speaker was Professor Steven Kraines, from The University of Tokyo – Future Center Initiative. 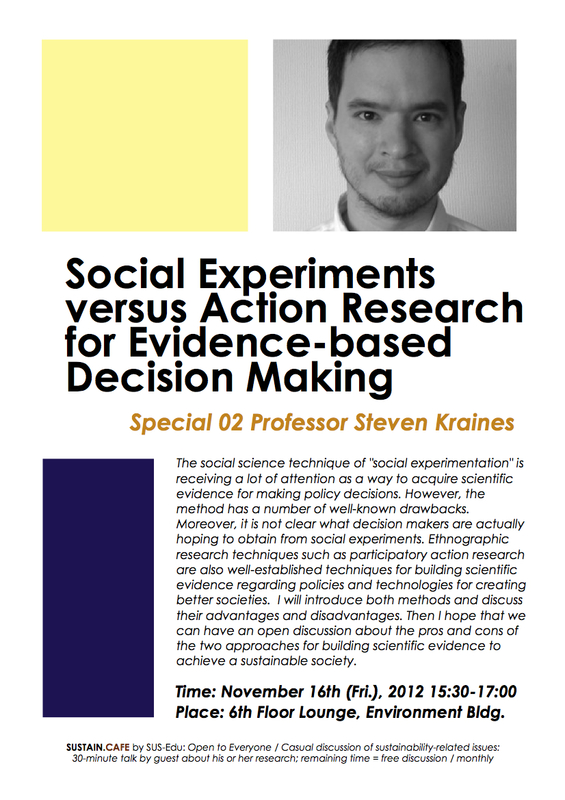 The social science technique of “social experimentation” is receiving a lot of attention as a way to acquire scientific evidence for making policy decisions. However, the method of social experimentation has a number of well-known drawbacks. Moreover, it is not clear what decision makers are actually hoping to obtain from social experiments. 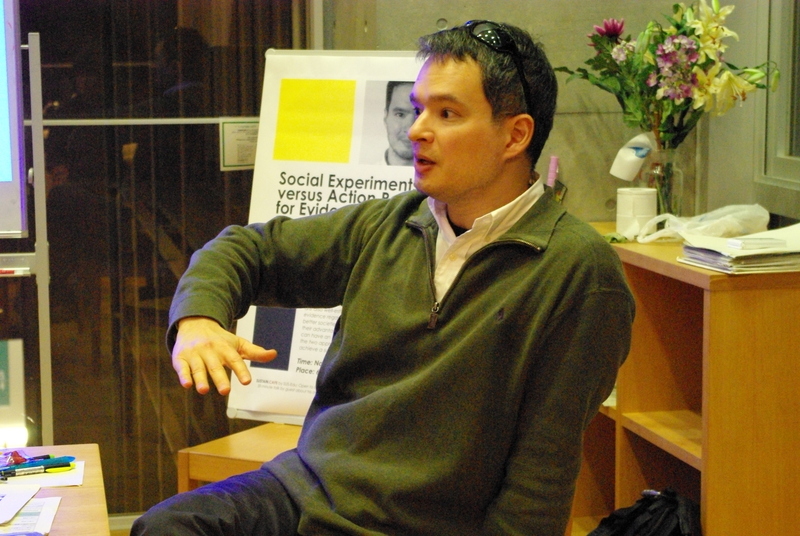 Ethnographic research techniques such as participatory action research are also well-established techniques for building scientific evidence regarding policies and technologies for creating better societies. I will introduce both methods and discuss their advantages and disadvantages. Then I hope that we can have an open discussion about the pros and cons of the two approaches for building scientific evidence to achieve a sustainable society. A special SUSTAIN.CAFE was held on November 1st, 2012. 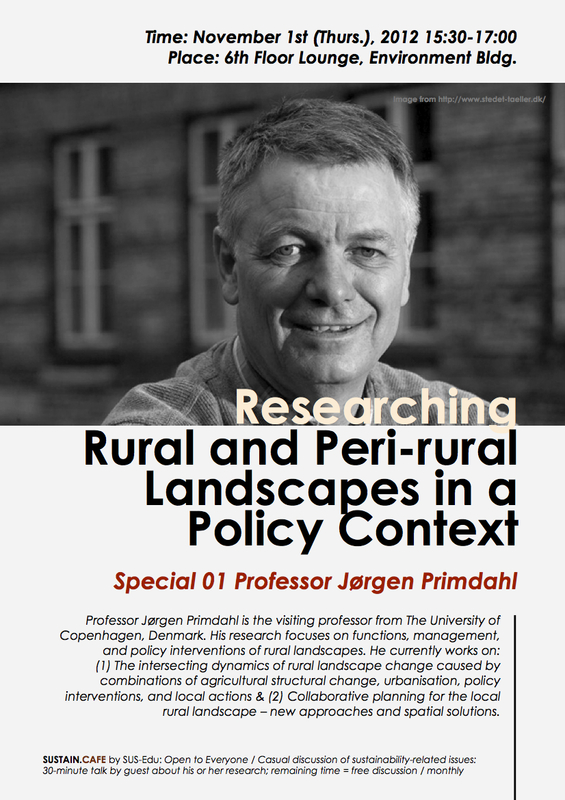 The speaker was Professor Jørgen Primdahl, from The University of Copenhagen. Sustainability science faces the critical challenge of establishing itself as an academic field. To address complex sustainability issues requires development and use of interdisciplinary approaches, including natural sciences, social sciences, and humanities. Active collaboration with various stakeholders in society, involving academia, industry, government, and civil society is also critically important for transdisciplinarity. This leads to the overarching question of how to deal with the issue of institutionalization. 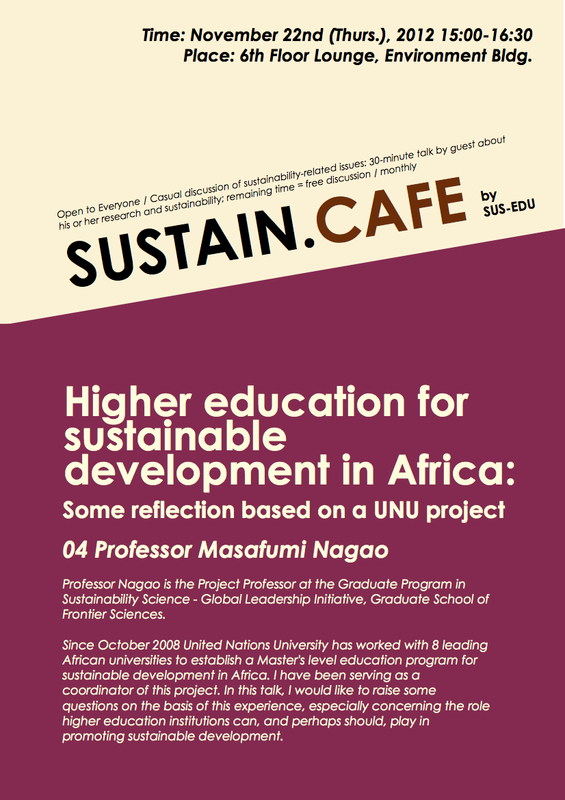 Professor Yarime will talk about his experience of studying sustainability science and outline the numerous challenges the field is encountering in creating innovation for global sustainability. 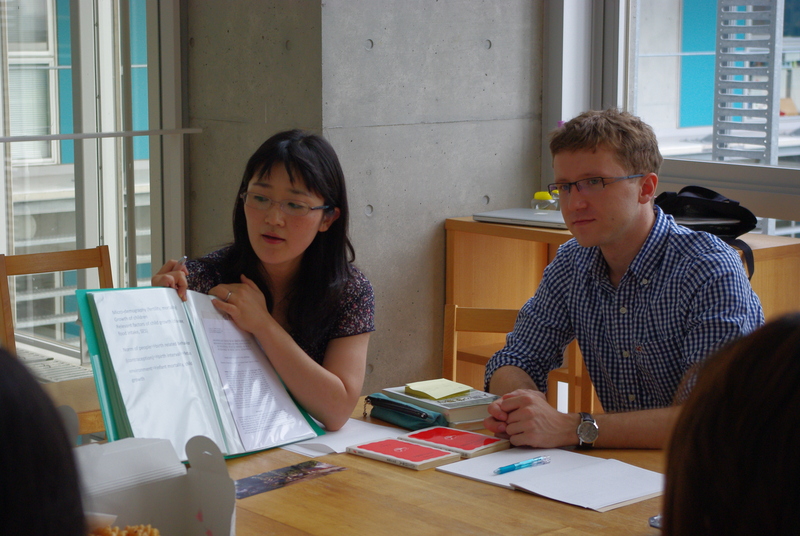 The second SUSTAIN.CAFE was held on July 6th, 2012. The speaker was Dr. Makiko Sekiyama, from the Graduate Program in Sustainability Science (GPSS), Graduate School of Frontier Sciences. 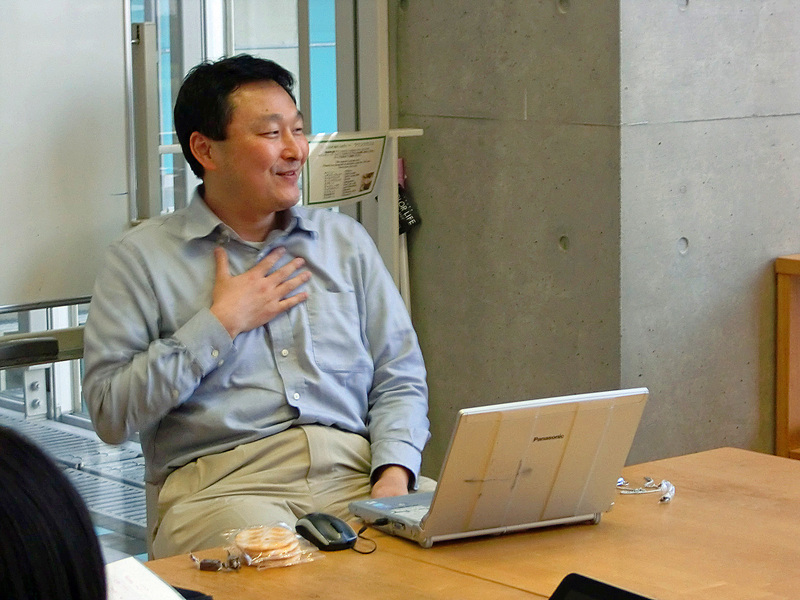 Dr. Sekiyama is an expert on international health and has been involved in many projects overseas. The title of her talk was “Field Science and Sustainability Science”. Using photos from her research trips, she took us through her journey of first becoming interested in the field, deciding to devote her career to helping people in developing countries, and experiencing the difficulty of bringing about actual change in issues as complex as health & nutrition. Her first experience in visiting a developing country was a shocking one. In her first year in college, a friend living in Singapore invited her to take a trekking tour in rural Thailand. Departing from Chiang Mai City, it took one day of riding elephants to reach a very remote village, where the Akha Hill Tribe lives. In high elevation with no electricity, it was too cold to sleep at night. Staying awake, she noticed that local villagers had gathered around to sell something to the older participants in her group. They were selling illegally planted cocaine (coca leaves). Watching drugs being sold on her first trip was surprising enough; realizing the impoverished conditions they were living in was even more startling. Though still vague, she decided she wanted to work for an international organization to help those in poverty and chose to study under a professor in the School of International Health, Graduate School of Medicine, University of Tokyo. She started studying child nutrition and health and the first opportunity she had to research abroad was in Bangladesh. It was 20 years after UNICEF and the WHO decided to provide safe drinking water from tube wells and arsenic contamination had become a serious health concern. Previously conducted research could not find a correlation between arsenic intake and toxication to arsenic, which lead her professors to hypothesize that nutritional status or nutritional intake somehow moderates this relationship. She monitored what people eat during the day and closely observed how they cooked their food. Research findings that concentration of arsenic in cooked rice contributed significantly were published in prominent journals. Many field researchers have their own way of coming to “know” the field. Dr. Sekiyama’s method is to visit the kitchen; an idea she had learned from reading a book by Yoshiyuki Tsurumi (“Banana-to-Nihonjin [The Banana & Japanese]“) a famous fieldworker in South-East Asia. This method yielded an interesting result in her research in Indonesia, which involved living in Indonesia for 2 years, to determine the relevant factors for child growth, such as disease, food intake, socio-economic status, etc.. In Indonesia, many street vendors operate inside schools, selling snacks to students between and after classes. The majority of snacks such as ice cream and chips contain only carbohydrates and fat; they lack the micro nutrients which are important for the child’s growth. The large cost of snacking (which accounts for 30~40 percent of household income) was a significant cause of households not being able to purchase nutritional foods. Thinking, if only they could replace their snacks with their traditional foods, she suggested banning the sale of snacks inside schools. Her peers were very much skeptical; they asked, “What would happen to the vendors? Where would their income come from? How can you insure their livelihood?”. Understanding the complex and dynamic causes of health problems is a hard task. Yet, Dr. Sekiyama has always thought that writing papers alone contributes little to solving these problems. This is why she has recently started projects in Indonesia & Rwanda to improve the nutritional conditions there. 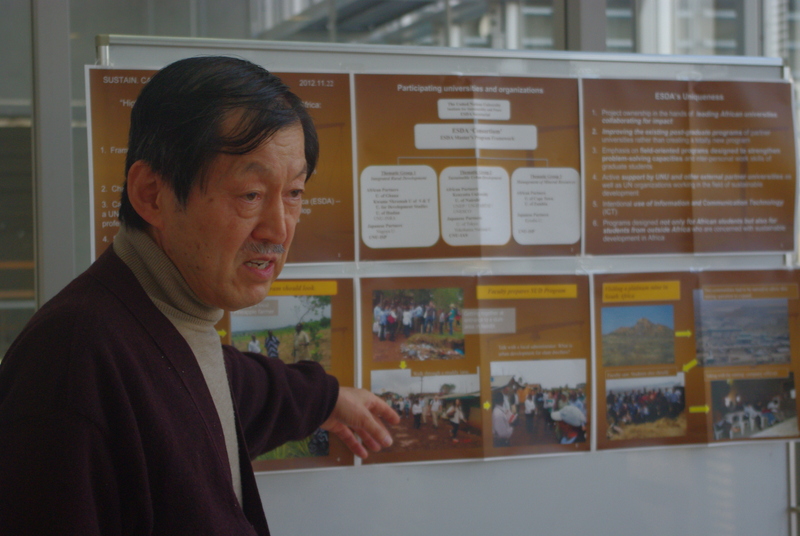 The project in Rwanda is a collaborative effort between World Vision Rwanda, World Vision Japan and the University of Tokyo. The traditional method of giving nutritional supplements did not penetrate into the very remote areas and the high dependence on foreign aid was unsustainable. By conducting a intervention survey to make home gardens for greater access to fruits and vegetables, she wants to examine how the nutritional condition of children can be improved. To conclude her talk, Dr. Sekiyama mentioned how health science benefits from collaboration with other researchers. Health issues, having gained complexity over the years, eludes solution by any one discipline. Social, Environmental and Economic perspectives are all relevant to their solution. Yet, collaborative work between areas such as nutrition and agriculture have been rare until recently. The project in Rwanda is revolutionary in that it brings together researchers from agriculture, health, and policy studies. >> What kinds of ideas did her talk inspire? Share your ideas by commenting on this post! Details of her talk is coming soon.